Backs Lee Byrne and Aled Brew have reversed the current trend of Welsh players switching to France by signing for Newport Gwent Dragons for the 2014-15 season. 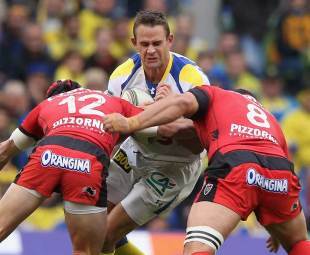 Byrne, who is at Clermont Auvergne, has signed a two-year contract while Brew, at Biarritz, has agreed a three-year deal. "I am excited to be returning to Wales to play again. I hope to bring my experiences from France back to the Dragons," Byrne said. "It's no secret that the best fans in Wales are at Rodney Parade and it will be a nice change to have them cheer for me and not jeer for me"
Brew, who moved to France in 2012, will return for a third spell with the Dragons. "I've really enjoyed my time in France and would like to think I've learned a lot during my time in Biarritz and that I've become a better player because of it," he said. "I have no regrets at all about my time in French rugby, it's been a fantastic experience but I feel it's the right time to come home for me and my family." Dragons director of rugby Lyn Jones said he was "delighted" to have signed the pair. "There are many in the game who still rate Lee as the best 15 in the UK. It's a significant signing for us. Aled has shown a desire to come back to his natural home where he was extremely popular with the supporters in the past and proved to be an excellent try scorer."